One of two E3120s on the campus of Taylor University in Upland, Indiana. I was making the rounds to Upland, Indiana as part of a family reunion. We’d just stuffed ourselves on ice cream at Ivanhoe’s, an ice cream parlor worth the drive from our hometown of Alexandria. Innocently, I suggested we drive by Taylor University. I’d dated a “good Christian woman” from there back in my youth. Whoop, Whoop went the windmill alert. 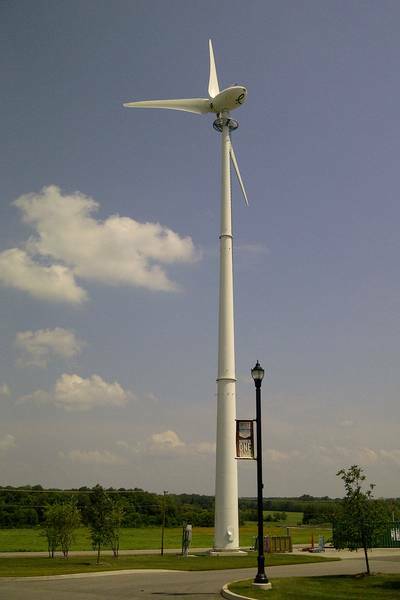 Lo and behold Taylor University had installed twin Endurance E3120 wind turbines in the parking lot of their new science center. I can’t escape the things—even on holiday. Another sign that wind energy has come of age when Upland, Indiana has wind turbines. It was a beautiful day, warm, but a bright blue sky. Naturally, I’d left my camera gear at home. Nevertheless, I leaped out of the car and took a number of photos with my cell phone. Tayor did this right. The turbines were on 120-foot tall, well-exposed monopole towers right in the parking lot. They didn’t hide the turbines on some distant part of the campus. They put them right there in front where people could see them. Better yet, there was no off-putting fence with barbed wire and nasty signs saying they would shoot you on sight if you went up and hugged a wind turbine. In fact you could hug these turbines. They were easily approachable. The installation was neat and tidy and looked professional. Both turbines included a full ladder with side rails and fall protection system—something not always found on “small” wind turbines. 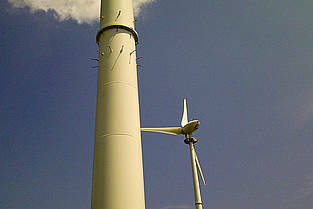 The E3120 is a 19.2 meter diameter downwind turbine, rated at 50 kW. Wind turbines of this size installed in California were typically rated at 100 kW. To Endurance’s credit, the turbine is not overrated because it is intended for moderate wind sites like those in north-central Indiana. The two turbines were installed in late summer 2011 and there is some grease showing on the rotor of one turbine, likely from the pitch bearings. Taylor University is a small, private, interdenominational, evangelical Christian college. In conjunction with a 10 kW solar array on the science building, the installation cost $700,000. I’d guess that the turbines alone cost something more than $300,000 each. More photos can be seen at Endurance.